Welcome to the home of New Mexico’s premier outdoor adventure company! We hope you enjoy our website. If you have general questions or need further information, please call or e-mail. 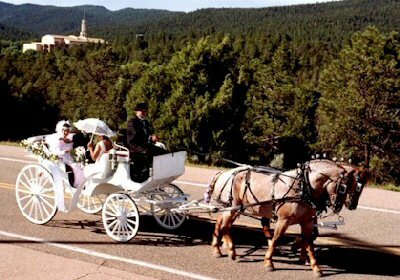 Have you thought about a festive and classy horse drawn wagon or carriage ride for your upcoming wedding or special event? We can provide one in downtown Santa fe, Albuquerque, Las Vegas or anywhere statewide. E-Mail Us by clicking here!! Visit Bear Creek Adventures on Facebook. © 2002-2019 Copyright Bear Creek Adventures LC. All rights reserved.